If you are interested in joining the Bridgeport Police Department or any police department in Connecticut for that matter, you’ll need to prepare yourself physically and mentally. 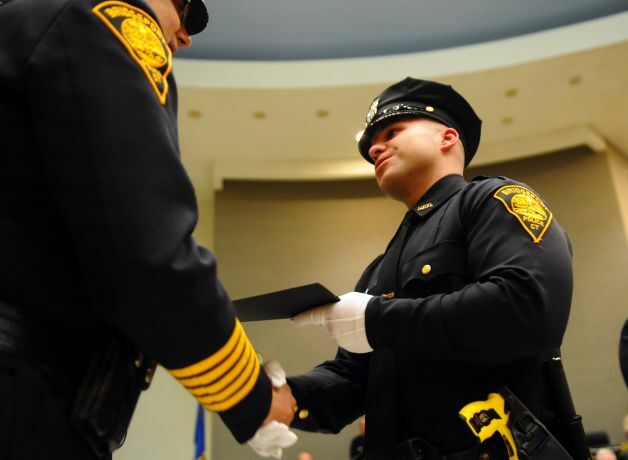 According to the Connecticut Police Officer Standards and Training council, all aspiring police officers have to pass the academy and get certification to become an officer. Applicants must meet the following minimum requirements. The applicant has to be at least 19 years old. Must have a valid Connecticut driver’s license. Applicants have to pass the physical examination before being appointed. Applicants with felony convictions will be disqualified. If you served in the military, an honorable discharge from the US Armed Forces. Applicants will also be subjected to a polygraph exam. A written Civil Service Examination is also required. Training is very demanding physically so you must be in shape before you even think about applying. It will help too if you do a lot of pushups, sit ups and jogging to lose those extra pounds and make your body more flexible. This point cannot be overemphasized enough since Connecticut requires applicants to meet the state’s minimum fitness standards. Push a car 15 feet. Run 1 and a half miles in 15 minutes. Crawl in a 2 x 2 ft. window. Exercises include pushups, sit ups, running, and more. These workouts moreover, are timed and there are strict rules on how to do each routine. Because of the intense nature of the physical fitness test, you need to get in shape before you join. If you want to learn how to prepare for the police academy you can try http://www.prepareforthepoliceacademy.com/, which is a complete step by step guide for passing the exam. In addition, the guide includes over 200 practice test questions. Apart from the physical training, you also have to undergo the academic curriculum, which totals more than 900 hours including the 480 hours mandated by the Connecticut police force. The training schedule is usually five days a week, 8 hours a day and takes 20 weeks to complete. The subjects taught varies, but at the Stamford Police Department candidates have to learn about defensive tactics, proper use of firearms, first aid and community relations. In addition, the curriculum will include but not be limited to, studying of patrol procedures, criminal law and search and seizure. All candidates need to complete all the physical and written exams and pass the background check to be considered. After completing the academic training, you will be assigned to an FTO (Field Training Officer). During this part of the training, you will be required to meet or exceed the standards set by the state for its police officers, as it serves as a transition point from training to actual police duty. The duration of the program varies per county, but usually it is at least 16 weeks. Once you pass the training you can begin your career or choose from select fields. Among your career options are a detective, bomb technician, patrol officer, freeway patrol or an academy instructor among others. Salaries vary depending on which police department you apply. At the Hartford Police Department you’ll have an annual salary of $50,407, while at the Waterbury Police Department it is $43,423. Aside from salaries however, police officers in Connecticut receive additional benefits such as educational incentive pay, a deferred retirement option plan, dental insurance and full pay while completing studies at the academy. Many of the departments also provide group life insurance, group medical benefits and additional incentives. Aside from these, those who pass the physical and written examand become police officers can avail of a 20 year retirement plan, get military leave, deferred compensation and a pension plan. Obviously the single most important thing you need to do to increase your chances of passing the test is to get in shape. You don’t need to hit the gym every day, although that will help, but working out at home is a good alternative. Aside from working out, you can also go online and use the Internet to help with your studies and preparation. Here are some online resources you can try. http://www.50states.com/connecticut/police_departments.htm offers a complete list of all police departments in CT, along with information which county they are in, the contact numbers and official website if available. http://education-portal.com/articles offers you a list of several free courses available online. These courses on the URL are all related to law enforcement, and many come from some of the country’s most prestigious universities. http://www.onlinepoliceacademy.org/ is an online training class for aspiring police officers. The courses featured in this site were written by experts in the field of law enforcement. The links provided above cover a lot of ground and are not limited to the written and physical exams. Most of them also provide advice for applicants so you can prepare yourself for the polygraph test, the oral interview and how to keep focused during the exam. The most important thing you need to remember during the written examination is to focus. If you do that and you’re physically fit, your chances of passing will be high.